This is the first in a series of short posts about the talks given at the Special Symposium on Advances in Modeling and Analysis Using Python, held at the 91st AMS Annual Meeting, on January 27, 2011, in Seattle, WA. The full program of the Symposium, with links to abstracts and presentation screencasts are available online. 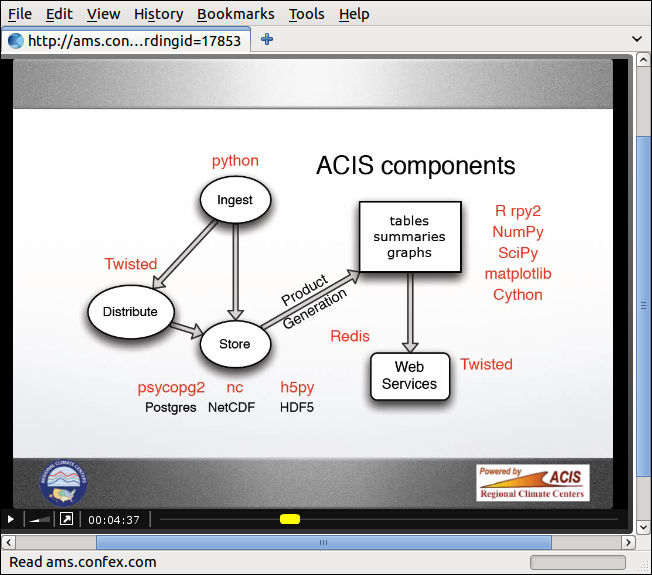 In his talk “Using Python to create climate service products at the Regional Climate Centers: Python and the Applied Climate Information System (ACIS),” Bill Noon describes how Python is used to create climate data products at the Northeast Regional Climate Center in Ithaca, NY. He discusses how Python is used as a glue between ACIS components and ways that Python packages help you, relatively straightforwardly, optimize system performance. Python packages used in various steps of the workflow are given in red. Notice how Python provides a single computing environment in which all of the steps of the workflow are accomplished. Say goodbye to an unwieldly kludge of shell scripts, Matlab/IDL scripts, compiled code, and make files! Say hello to being able to pass variables and other memory structures from one part of the workflow to the other! This entry was posted in Advanced, Featured Tips, Interfaces, Webservices. Bookmark the permalink.